ransformative, comforting and patient-sensitive. When it opens in April, the UC Gardner Neuroscience Institute will serve as a much-needed central hub of neurological care, expertise and research for the region, and all under the same roof. But it’s bigger than that. It’s more personal than that. 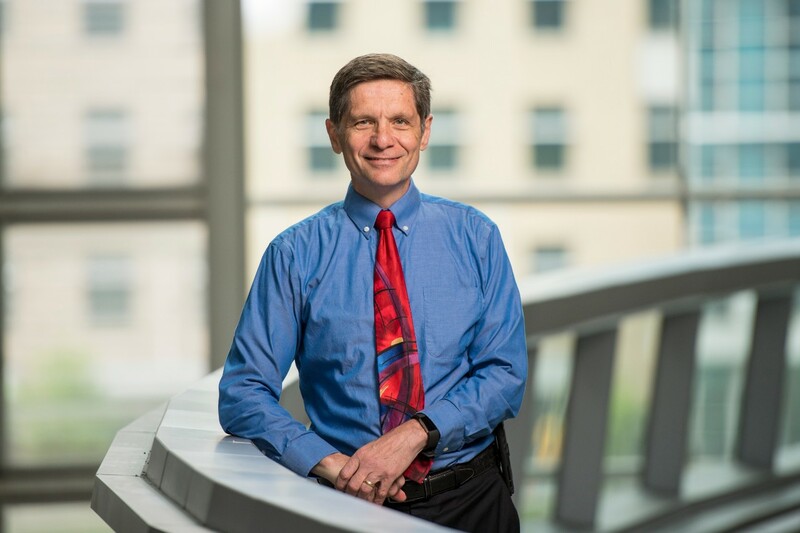 For Dr. Joseph Broderick, a new home for neuroscience at UC Health represents hope. Hope for patients to come and a commitment to people neurological diseases have claimed. A year ago, Broderick, director of the institute, signed the final steel beam of the building. Before it was raised into place, he wrote, “For Phyllis and Myles,” his mother-in-law who died of Alzheimer’s disease and grandson who had a stroke several weeks after birth. When the doors open, patients will find that the $68 million facility — a 114,000 square foot addition at the corner of Martin Luther King Drive and Eden Avenue — is one that’s been designed and customized specifically with them in mind. 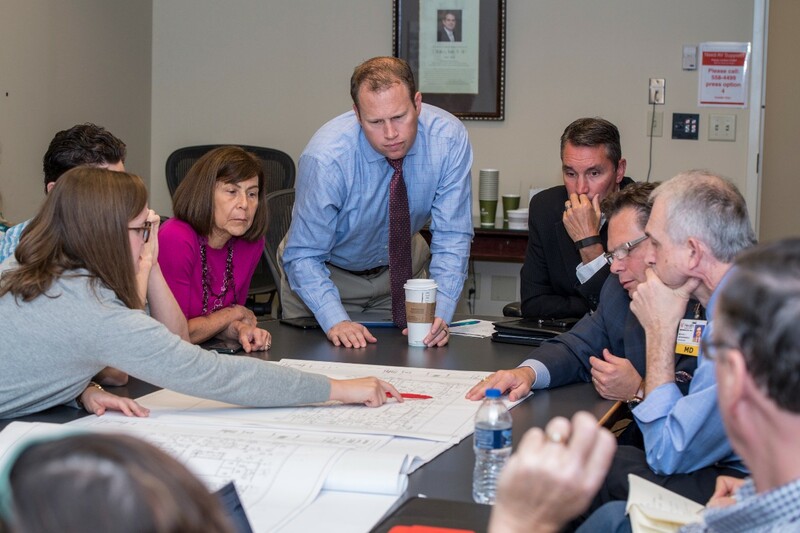 Before a single shovel of dirt was turned, planners turned to patients and others to ask hard questions: What type of facility will best serve people who are recovering from a stroke, a traumatic brain injury or fighting a brain tumor? How can design meet the needs of those managing life with Alzheimer’s disease, epilepsy, Parkinson’s disease or other neurological diseases? 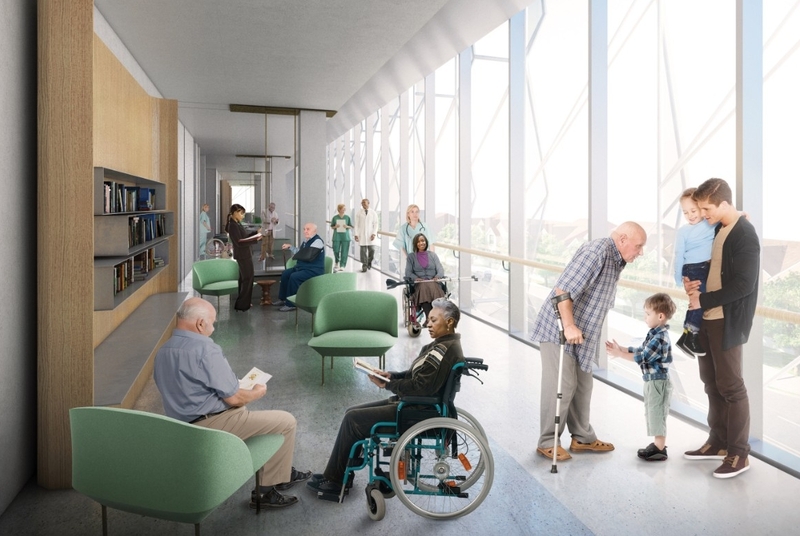 An architectural rendering shows the patient lounge area, which will include a library of resources for patients to learn more about neurological conditions. UC Health hired global architecture and design firm Perkins+Will to oversee the planning and design of the facility. They sought input from doctors, staff and students, and worked with an advisory committee made up of current patients and caregivers, to address every step in the patient’s journey — from the parking garage to the exam room. Throughout the two-year design/build process, plywood models were built, mock patient rooms were staged, textiles samples and finishes passed around, all based on feedback from the patient advisory group, and reviewed by clinicians and staff. Previously, patients would visit a separate location for rehabilitation and physical therapy. Now, the first floor of the new building has space for therapy and exercise equipment, as well as a fully simulated apartment for patients to do occupational therapy. Design also focused on ease of patient flow. Exams rooms were made larger, so that the patient, family, provider and additional clinical experts can all be in the room comfortably, discussing the patient’s care. Until now, the UC Gardner Neuroscience Institute had been distributed across multiple locations. It comprises more than 125 physicians who work in 15 different specialty areas and see 56,000 patients a year. Since 2016, the Neuroscience Institute has been named in honor of the James J. and Joan A. Gardner Family Foundation, recognizing the Gardner family’s leading support of its mission of research, patient care and education. In 2014, the Gardner Foundation pledged $14 million to fund the new facility and has remained key partners throughout its design and construction.That foundation and a broad network of community supporters have contributed more than $47 million to the project. The private campaign for the facility supports not only the building, but allows for expanded research, recruitment and community engagement efforts around neurologic disease. As a new fixture along the Uptown innovation corridor, the Uptown Consortium has also played a key role in the facility, by contributing nearly half of a total $41 million in New Markets Tax Credits, to leverage the philanthropic support and UC Health investment in the construction project. Approximately 25 percent of the $41 million will directly impact the UC Gardner Neuroscience Institute building’s construction.